Everyone is beginning to get settled in and a routine is becoming established. After yesterday’s successful campaign of desodding, today’s job was to clean down the cuttings and remove the remains of any of the sod layer left and remove the topsoil immediately below the sod. People got to use their trowels for the first time and the operation began to take on the feel of a real archaeological dig. 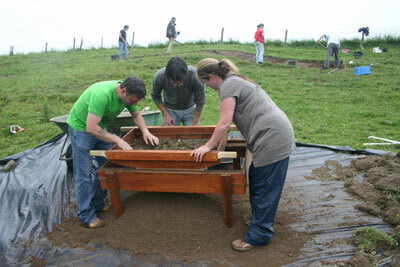 Clearing started in Trench 3 and the team split into smaller groups for the different tasks. Soil sampling for magnetic susceptibility analysis. 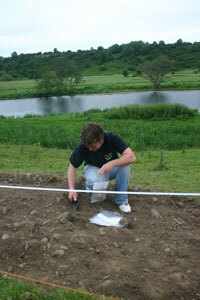 Using a plastic trowel rather than a metal one to avoid contamination of the samples, Mark took soil samples on a 1m x 1m grid from immediately below the sod surface before cleaning down commenced . These will be processed later and the magnetic susceptibility of each sample will be determined at a later stage. A similar process was carried out on the surface before desodding took place using a field measurement instrument and additional samples will be taken as the trench is dug further. So as well as mapping the horizontal variation in magnetic susceptibility, we will also be able to look at the vertical variation and we hope that this information will add to the overall picture of how the site was used. Before I go on, in case you are wondering, magnetic susceptibility literally measures the soil’s ability to become magnetised. What this idicates is where an area has been burned or where there has been a build-up of organic midden-like material which has rotted down (a bit like compost). Both of these processes cause chemical processes in the soil which can be detected and measured. Both of these characteristics are associated with human activity including settlement. More about magnetic susceptibility in the days to come. All of the material being excavated from the various trenches across the site are being sieved in order to maximise the number of finds recovered. 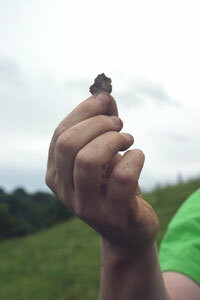 A number of pieces of flint were recovered as well as a number of pieces of animal bone. The flint suggests prehistoric activity (possibly Neolithic). Is the animal bone the same date? Hopefully specialist analysis after the end of the dig will help to answer this question. If it is prehistoric or Neolithic, these bones could represent the remains of some of the dinners consumed by the occupants of the Rossnaree Enclosure. This entry was posted on July 7, 2010 by Conor Brady. It was filed under Archaeology, Excavation, ireland, neolithic, River Boyne and was tagged with archaeological techniques, Archaeology, Brú na Bóinne, Excavation, flint, Ireland, Rossnaree archaeological dig, Rossnaree dig.